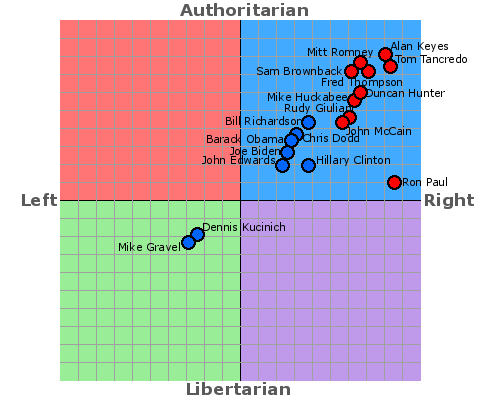 Political Compass..where are WE on it? In the interest of full disclosure lets all take the test and post the results. Not sure how to post the graph, I would be thankful for any guidance. I am near Gandhi too. Sorry I can't figure out how to post the graph either. when you are done you can however request a printable graph, and then we would be able to click on it to see your exact score. I'm still with my old pal Bogowo on the trail to anarchy. cool, thanks. This is me. I think we did it a few years back, but things change and we have some new people so it is good to do it again. I have a feeling that if we had a point for the "average north American" that all of us so far would have to conclude that we are freaks....but maybe I am wrong. Lord look at where even Obama is suppose to be on that graph!!!! Here are my numbers. I give up on the graph! for which I think that take away is that our leaders do not represent our values. Not a shocker given my background and my claims that both political parties need to die. Lot of slippery wording in this version. I stopped filling it in. We have had a few others of these things over the years - haven't found them on a search. have you got a better one? Where are our right wing members of this website? Horseshit on where Obama is supposed to be. » Political Compass..where are WE on it?